This morning I saw a video on Facebook of young German people getting down in colorful workout duds from the late '70s or early '80s -- I assumed the funky music backing it was the original audio. 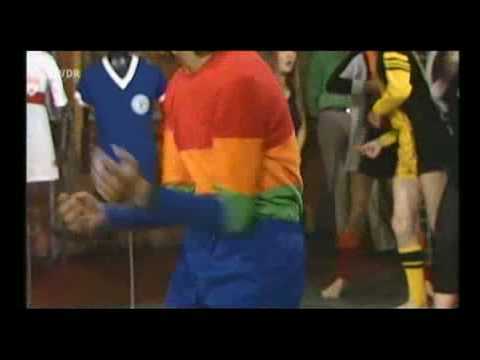 After looking for it on YouTube so that I could embed it here, I discovered that this was not Germany's answer to the Solid Gold dancers, but a football (soccer) fashion show! Needless to say, the original Tyrolean sounding backing music doesn't have the same effect as the edited clip, but it's still entertaining. Perhaps the most comical part is the audience applauding at the end.